Add an adorable turtle to your garden and create a convenient pathway using this Esschert Design Turtle Stepping Stone. Placing a stepping stone in your yard helps direct foot traffic away from your favorite plants, and this unit also brings a charming hint to the area. A slightly raised head and tail begin the familiar turtle shape, enhanced by the textured, oval stepping area which evokes a shell. Four feet extend from this shell shape, furthering the look, and the cast iron construction offers durability. The 8.5" length and 7.25" width of the center section allows this item to perfectly nestle within your landscaping, and its detailed pattern handily mimics that of a turtle shell. The all black color of the piece meshes with many settings, and its flat base makes placement simple. 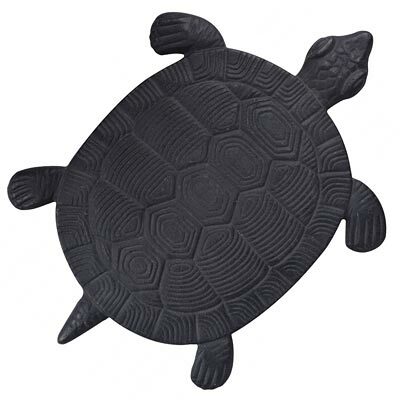 Bring a charming bit of wildlife into your landscaping using this Turtle Stepping Stone.